By Felix Horne (04/12/16) FPIF: (June 20, 2016) Human Rights Watch, Inserts added. Since November (2015), state security forces have killed hundreds of protesters and arrested thousands in Oromia, Ethiopia’s largest region. It’s the biggest political crisis to hit the country since the 2005 election but has barely registered internationally. Part of the problem is the government’s draconian restrictions on news reporting, human rights monitoring, and access to information imposed over the past decade. But restrictions have worsened in the last month. Some social media sites have been blocked, and in early March security officials detained two international journalists overnight while they were trying to report on the protests. With difficulty, Human Rights Watch interviewed nearly 100 protesters. They described security forces firing randomly into crowds, children as young as nine being arrested, and Oromo students being tortured in detention. But the Ethiopian media aren’t telling these stories. It’s not their fault. 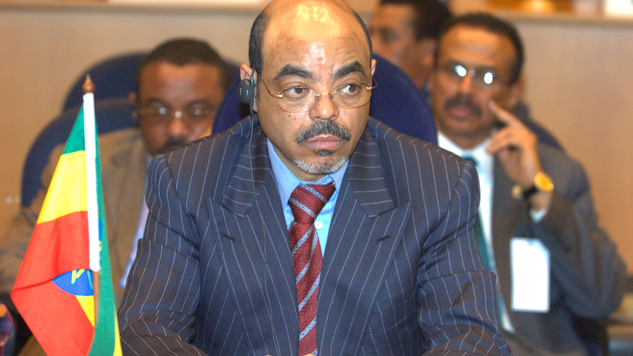 Photo Added: Meles Zenawi, Ethiopia’s original “developmental autocrat” and behind him (left), Hailemariam Desalegn, who would succeed him upon his death and has continued what critics say are bread-without-freedom growth policies. (Photo/Mail & Guardian Africa). Ethiopian journalists have to choose between self-censorship, prison, or exile. Ethiopia is one of the leading jailers of journalists on the continent. In 2014 at least 30 journalists fled the country and six independent publications closed down. The government intimidates and harasses printers, distributors, and sources. The government may believe that by strangling the flow of information coming out of Oromia it can limit international concern and pressure. And so far the response from countries that support Ethiopia’s development has been muted. The deaths of hundreds, including many children, have largely escaped condemnation. Researcher, Horn of Africa April 12, 2016. Oromia, Ethiopia’s largest region. (Photo: Irish Aid Org). 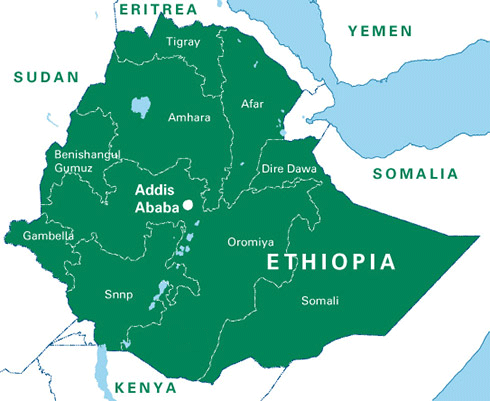 The protests began on November 12, 2015, in Ginchi, a small town 80 kilometers southwest of Ethiopia’s capital, Addis Ababa, which is surrounded by Oromia region and home to most of Ethiopia’s estimated thirty-five (35) million Oromo, the country’s largest ethnic group. The Ethiopian government has also increased its efforts to restrict media freedom – already dire in Ethiopia – and block access to information in Oromia. The government has also jammed diaspora-run television stations, such as the US-based Oromia Media Network (OMN), and destroyed private satellite dishes at homes and businesses. The decision of authorities in Ginchi to clear a forest and football field for an investment project triggered protests in at least four hundred (400) different locations across all the seventeen (17) zones in Oromia. Photo Added: The Ethiopian government has reportedly ceased its plan to expand its capital, Addis Ababa, after protesters from Oromia demonstrated against the expansion plans over concerns that they would lose their homes. (Photo:Twitter @ethiopiacrisis). Security forces, according to witnesses, shot into crowds, summarily killing people during mass roundups, and torturing detained protesters. Because primary and secondary school students in Oromia were among the early protesters, many of those arrested or killed were children under the age of 18. Security forces, including members of the federal police and the military, have arbitrarily arrested students, teachers, musicians, opposition politicians, health workers, and people who provided assistance or shelter to fleeing students. In November 2015 when the protests started, protesters initially focused their concerns on the federal government’s approach to development, particularly the proposed expansion of the capital’s municipal boundary […] for Master Plan. As the protests continued, the government in mid-January 2016 made a rare concession and announced the cancellation of the Master Plan. But by then protester grievances had widened due to the brutality of the government response, particularly the high death toll and mass arrests. Farmers and other community members joined the protesting students, raising broader economic, political and cultural grievances shared by many in the ethnic Oromo community. Human Rights Watch’s research indicates that security forces repeatedly used lethal force, including live ammunition, to break up many of the 500 reported protests that have occurred since November 2015. Security forces regularly arrested dozens of people at each protest, and in many locations security forces went door-to door-at night arresting students and those accommodating students in their homes. 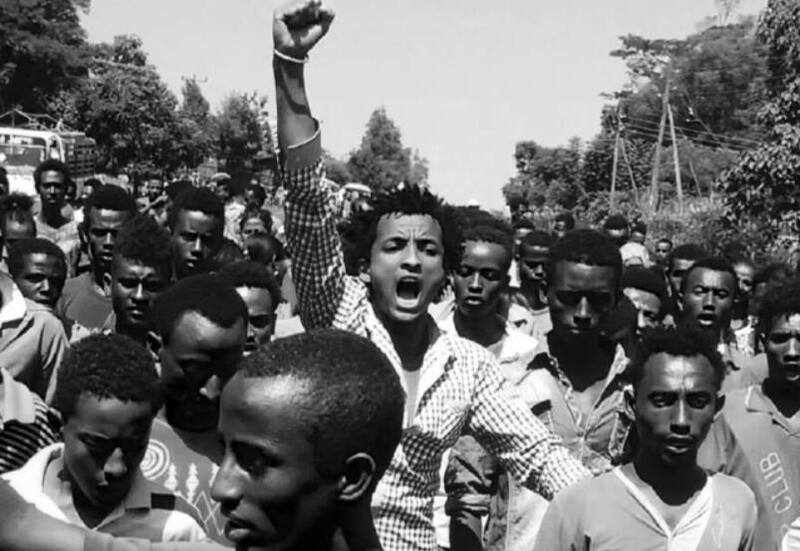 Security forces also specifically targeted for arrest those perceived to be influential members of the Oromo community, such as musicians, teachers, opposition members and others thought to have the ability to mobilize the community for further protests. 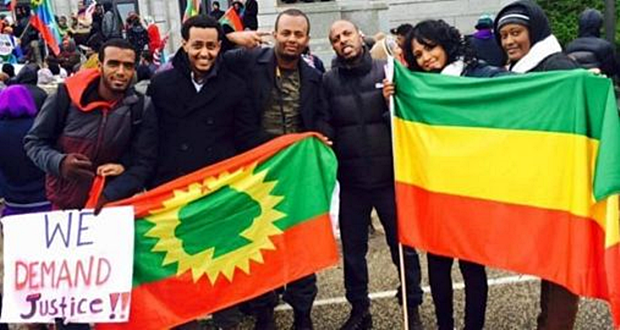 Video Added: Oromo Protests Global Solidarity Rally in London, United Kingdom. Many of those arrested and detained by the security forces have been children under age 18. Very few detainees have had access to legal counsel, adequate food, or to their family members. Security forces have tortured and otherwise ill-treated detainees, and several female detainees described being raped by security force personnel. The Ethiopian government has claimed that protesters are connected to banned opposition groups… a staunch advocate for non-violence and for the OFC’s said, “Students peacefully protesting in front of the United States embassy in Addis Ababa have also been charged under the criminal code“. The Ethiopian government should drop charges and release all those who have been arbitrarily detained and should support a credible, independent and transparent investigation into the use of excessive force by its security forces. Photo Added: Global Solidarity Rally. Since the start of the Oromo Protests, the Ethiopian government, using its state and affiliated media outlets, has been ridiculing the above photo of unity between Oromo and other Ethiopians – all standing together to oppose the Ethiopian government’s illegal land-grabbing of Oromo farmers’ land and its killing of the peaceful Oromo protesters. This photo has greatly undermined the Ethiopian government’s divide-and-rule policy of the last two decades, when it stayed in power by pitting one group against the other – creating an atmosphere of disunity. (Article: BBC, photo: Minneapolis, Minnesota 12/2015). It should discipline or prosecute as appropriate those responsible and provide victims of abuses with adequate compensation. Ethiopia’s brutal crackdown also warrants a much stronger, united response from the international community. 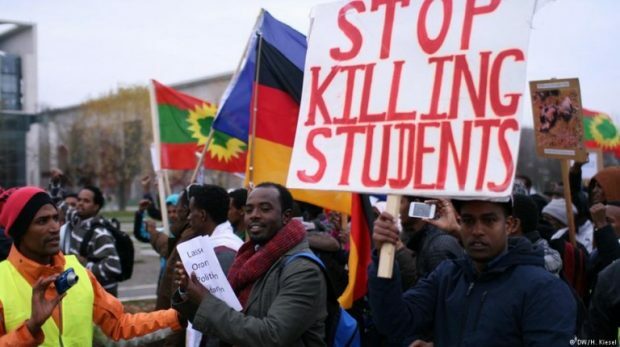 While the European Parliament has passed a strong resolution condemning the crackdown and another resolution has been introduced in the United States Senate, these are exceptions in an otherwise severely muted international response to the crackdown in Oromia. Ethiopian repression poses a serious threat to the country’s long-term stability and economic ambitions. Finally, Ethiopia’s international development partners should also reassess their development programming in Oromia to ensure that aid is not being used – directly, indirectly or inadvertently – to facilitate the forced displacement of populations in violation of Ethiopian and international law. (This article has been shortened). Oromos make up the largest chunk of Ethiopia’s 95 million people, and their language is the fourth most widely spoken African language across the continent. Yet Oromo is not recognized as a federal working language. Human Rights Watch Urgently Needs Your Donations. Click to donate. Human Rights Watch: Such a Brutal Crackdown.